Apples and Butter: Cookie Party! Every Christmas growing up, my mother would bake dozens of cookies and my brother and I would get to invite all of our friends over for a cookie decorating party. Since living on my own, it has never fully felt like Christmas without these parties. This year, I decided it was time to rectify the situation by having my own cookie party. I collected my mother's shortbread recipe, cheated with a gingerbread mix, and got the boyfriend's mother's recipe for frosting. I knew the party was going to be a success when I tasted my mother's shortbread and was immediately transported back to the parties of the past. My boyfriend felt the same way when we finished his mom's frosting and the flavor was exactly as he remembered. We made three batches of frosting (adding red and green food coloring to two of the batches) and placed half of each batch in a piping bag and the other half in bowls for spreading. With the addition of some store-bought decorations we set up the table and were ready to go. Blend butter and sugar in a mixer fitted with the paddle attachment. Sift flour and salt together and add it to the butter and sugar in a few additions. Add vanilla and blend well. Gather dough into ball and flatten slightly on waxed paper. Place in the refrigerator and chill 4-6 hours. 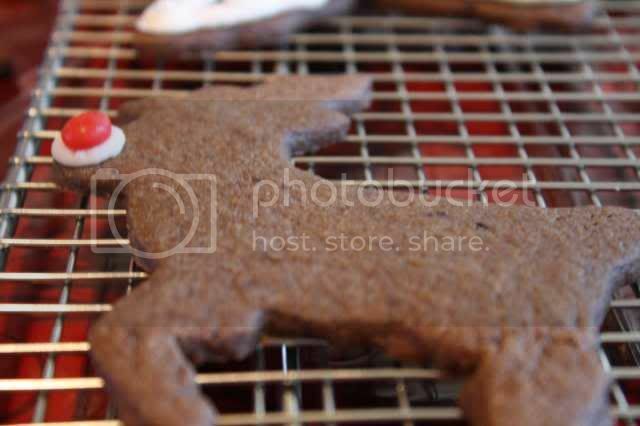 Roll dough to 5/8 inch thickness and use cookie cutters to cut desired shapes. Place on ungreased cookie sheets and refrigerate for 20 - 40 minutes before baking. Bake for 20 minutes, until just starting to color lightly - do not brown. Cool completely on racks before frosting. Combine butter, milk, cream, vanilla and salt in a stand mixer and blend. Add confectioners sugar in small amounts until all the sugar has been incorporated. Place half the mixture in a piping bag and the other half in a bowl for spreading. 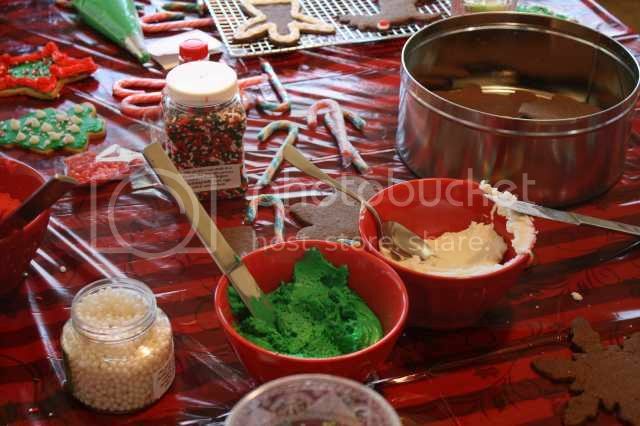 *Note - when making red and green frosting, reduce milk by 1 T and add food coloring at the end. There were so many amazing and creative cookies. I decided to include just two here, but could have easily included 15 or more. The whole day was a great success and a lot of fun. 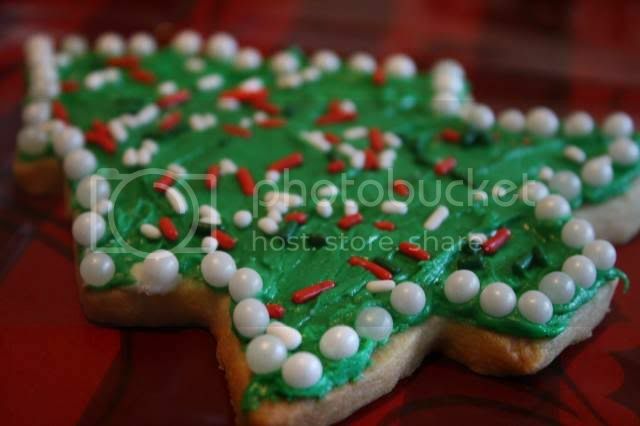 Cookie parties will again be a mainstay of my Christmas season. Merry Christmas everyone! mmmmmmm how fun. Love shortbread. Glad you are keeping the tradition going!! Your cookie party looks like so much fun. A great holiday tradition. This looks like so much fun! I just need a bigger kitchen to be able to ask people to help me out! Congrats on bringing back the tradition! Cookies look great. Kudos to you for resurrecting the party! What a fun time! Those cookies look so tasty. What a fun time and the cookies look beautiful. I love all the cookies I am seeing and learning about lately! Your shortbread cookies, sure do look good. I love the perfect Rudolph at the end! Delicious and darling. Oh my gosh! This reminds me SO much of many Xmases at your house when we were wee. Remember ornament night with Indian Princesses at your place? What was that, a century ago? I'm so glad to see you've kept up the cookie tradition, Jessica! I think that's a great idea to carry on the tradition with your boyfriend! Fun, and yummy. That shortbread sounds delicious! Hope your having good holidays!